RIM shows off BlackBerry OS 7.1 at CES | BlackBerry Blast! RIM didn't waste any time showing off the next version of BlackBerry OS. On the first day of CES, RIM showed off BlackBerry OS 7.1. The new OS will have a familiar looks, but will add support for Mobile HotSpot, NFC Tag support, and FM radio. BBM, BlackBerry Travel, and BlackBerry Traffic have also been updated. Las Vegas (CES 2012) - A wide range of software improvements await BlackBerry� 7 smartphone customers at the BlackBerry� booth (South Hall 3 Booth # 30326) at this year�s Consumer Electronics Show (CES 2012). Research In Motion (RIM) (NASDAQ: RIMM; TSX: RIM) is showcasing the new BlackBerry� 7.1 OS as well as updates to the BBM� (BlackBerry� Messenger), BlackBerry� Traffic� and BlackBerry� Travel� apps. The new OS and app updates make seizing and sharing the moment even easier. BlackBerry 7.1 will begin rolling out from carriers around the world beginning today and over the coming weeks1. The new releases of BBM, BlackBerry Traffic and BlackBerry Travel will be available on BlackBerry� App World� beginning today. �BlackBerry 7 delivered a next-generation platform for our customers around the world and the range of software updates announced today build upon the strengths of that platform to further enhance the mobile experience and make life easier, from managing daily tasks to planning big adventures,� said Mike Lazaridis, President and Co-CEO at Research In Motion. The BlackBerry 7.1 OS incorporates a new feature called BlackBerry� Tag that can change the way BlackBerry users share information and content. By simply tapping their NFC enabled BlackBerry� smartphone against another NFC enabled BlackBerry smartphone, users can make sharing easier than ever. They can instantly invite a friend to BBM, exchange contact information, documents, URLs, photos and other multimedia content, and they can also pair their BlackBerry smartphone with an NFC enabled Bluetooth� device. Support for BlackBerry Tag is just one of a number of enhancements in the updated BBM app (version 6.1) being released today. Additional features allow users to personalize their experience even more with support for animated avatars (animated GIFs)2, a dozen new and fun emoticons to spice up conversations, and the ability to customize chat bubbles with different colors. In addition, the new BBM app allows users to add customized personal messages of up to 160 characters in their online Profile, more than double the length supported in previous versions. Users can also now set the picture for their BBM avatar directly from the camera app � simply snap a picture and select �Set as BBM Display Picture� from the menu. With BlackBerry 7.1, users can be productive from virtually anywhere. They can now turn their BlackBerry smartphone into a mobile hotspot that can be shared by up to 5 Wi-Fi� -enabled devices, including laptops and tablets3. The 7.1 update also supports carrier implemented Wi-Fi calling services (UMA/GAN where available), allowing users to make Wi-Fi calls from their BlackBerry smartphone that don�t eat into their airtime minutes. Getting to any location is now so much easier with the new BlackBerry Traffic (version 3.0), a free app from RIM that is being released today. BlackBerry Traffic determines a user�s estimated time of arrival (ETA) based on current traffic conditions, and now includes hands-free turn-by-turn voice guidance. Planning, booking, managing, and sharing travel activities are also easier than ever thanks to the updated BlackBerry Travel app that is being released today. The new version adds support for contextual deals, such as offers for hotels and car rentals, or for arranging limo services to and from the airport. BlackBerry Travel can automatically keep track of a user�s bookings and schedule and quickly notify them if their flight is delayed or cancelled, and can then help them find a new flight right away. The automatic trip scanning feature pulls the travel details into the app, allowing the user to see all their travel updates in one place. Sometimes it�s nice when someone (or something) does the thinking for you. The Universal Search capability has again been enhanced to help users find what they are looking for. It now includes an auto-suggest feature that intelligently filters Bing� search results to offer users a variety of relevant Web sites based on their search terms. Love a good deal? Now finding and taking advantage of them is so much easier thanks to BlackBerry� Maps � an essential app that comes preinstalled on BlackBerry smartphones and has been enhanced in the BlackBerry 7.1 OS update. When users launch the new BlackBerry Maps application they can discover special offers, coupons, and discounts from nearby vendors. Users can immediately act on the deals presented to them by clicking to call the vendor or clicking to get the best route to the location where the deal is offered4. 1. 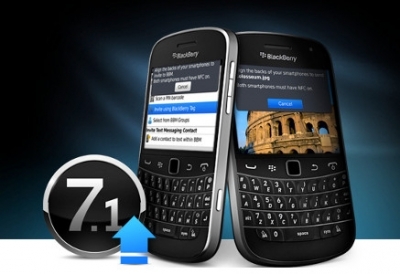 The BlackBerry 7.1 OS update is subject to carrier certification. Please check for availability with your service provider. 2. The animated avatar feature is supported on BlackBerry smartphones running OS 5.0 and higher. 3. Mobile hotspot feature requires BlackBerry 7.1 and may require an additional data plan. Please check with your service provider. 4. Please check with your service provider for availability of this feature.